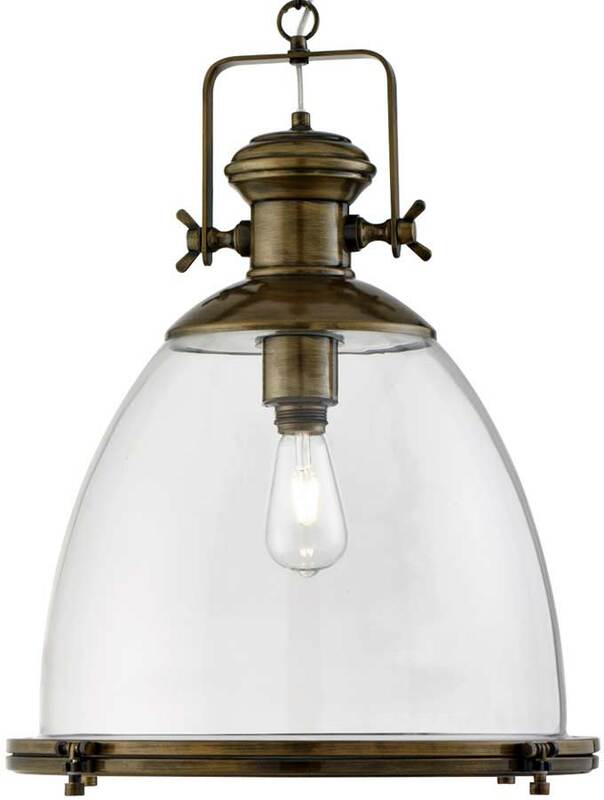 This large clear storm glass industrial pendant in antique brass has a solid industrial style with a traditional finish. The dome storm shade has ornate antique brass metal clips around the rim and matching stylish, chunky metal features around its top, with an adjustable chain attaching it to the ceiling. It looks fantastic in any post-modern living space, and the clear glass diffuser creates a nice lighting effect for the entire room. 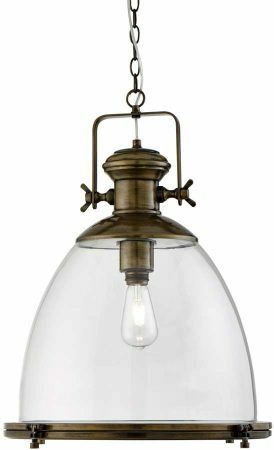 An industrial themed 48cm diameter storm glass pendant light, with antique brass swinging hinge top clamp and matching bottom shade clasps. A complementing metal suspension chain and circular ceiling cup completes the design. Ideal for use in almost any large room in the house and capable of accepting a reproduction vintage style light bulb to further enhance its graceful styling. Height adjustable at the time of installation by simply removing links from the chain suspension to a maximum drop of 2 meters. A polished chrome and opal white glass version of this retro ceiling light is also available to purchase, please see below for details.